A draft or planned event is one that is saved differently from a completed event. It allows you to plan data and then enter in the actual results/information later on. The system saves both the planned and completed information. Why save as a Draft? Saving as a "Save Draft" allows you to plan an event, and then go back in later and enter in the actual information. For example, you or your coach may want to plan a strength and conditioning session and the athlete can enter in the actual data from the session once it is completed. Alternatively a coach may want to schedule in a daily review for a group of athletes that they all need to enter separately. A coach can plan an event by following the "Enter Data for a Group" or "Enter data of an Athlete" steps outlined previously. E.g. -Instead of clicking on "Save and Close" (which saves it as a completed event), click "Save Draft"
-The event will be saved as a draft, and will be available for you to complete at a later date. -You can access it on the Calendar, Recent Entries or the My Schedule Page. In the Calendar, drafts are highlighted as a orange coloured event, and completed events are highlighted in blue (see below). 1. Click "Enter Data for Group"
4. The session will appear on their Calendars and My Schedules as a draft event that they can click to open. Go to the Calendar Page by selecting the "Calendar" Tab (to the right of the Home Page Tab). On the Calendar Page any events which are saved as drafts are highlighted in orange. To enter your actual session information into an event that has been saved as a draft, simply click on the name of the event (blue link). In the example above we clicked on the "Strength Session". The Event will then open so that the actual session information can be entered and saved as complete. The draft event that you open may have no information stored in it, or it may be completely filled in. Regardless, enter the actual session information that you completed, and then click "Save and Close". The information will be saved as completed, and it will appear throughout the system as a completed event. The planned data appears on the schedule along with completed data.They are both the same colour, but the planned sessions specify they are planned, and the completed events specify that they are competed. -The image above shows planned and completed events. To open an event, simply click on the name of the event and you will be able to enter data and save it as completed. How can I check that the athlete's have entered their data and saved it as completed? 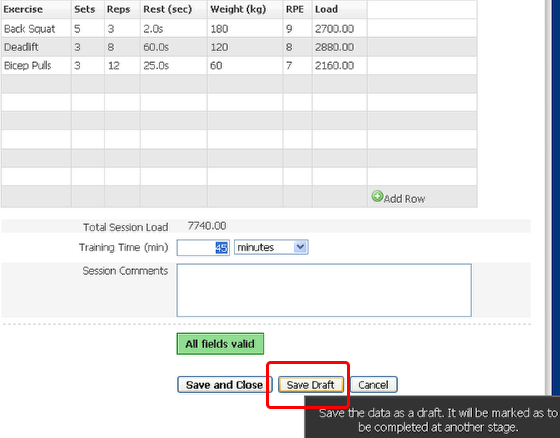 The easiest way to see if an athlete has completed a planned session it to run a report just for "Draft" events. To do this, Click the "Reports" Tab, or the Reports Button on the front page. Select the event and the athletes that you want to review e.g. Strength session. A report will run showing any strength events which have not been saved as completed. You can then choose to Send Message and you can send a message to all of the athlete's who's data appears in the report. This ONLY works on systems when athletes are responsible for entering in their own data.